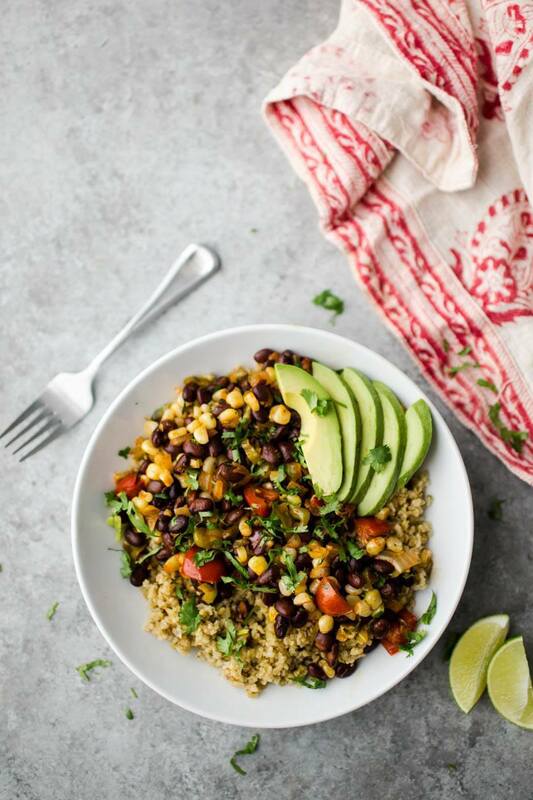 Black Bean Bowl with Freekeh | Naturally. I’m currently in Illinois, basking in the summer glow of the midwest (which I guess is called humidity). Mack has managed to meet nearly all his family in this whirlwind extended tour and I’m so glad we got back here when we did. 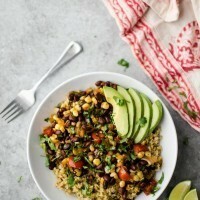 However, I wanted to make sure I popped in to share this black bean bowl recipe before summer produce started coming to an end. 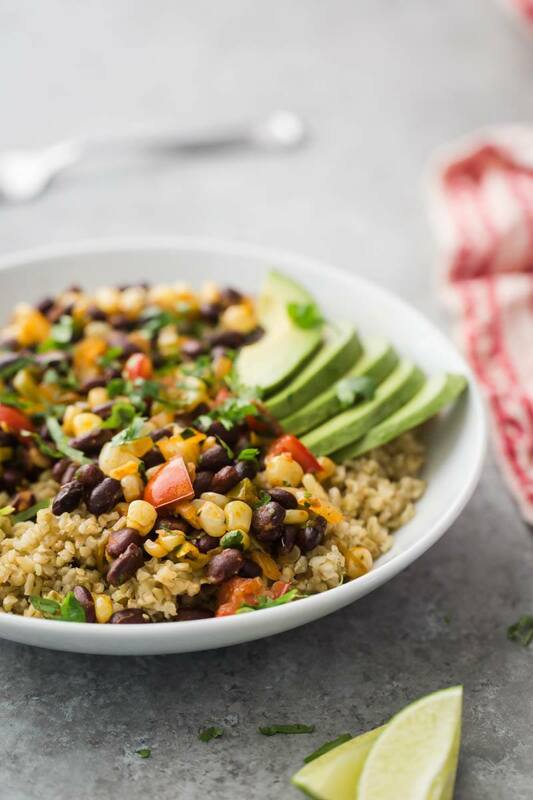 Of course, if you want to tuck this away, you can easily make this black bean bowl with frozen corn and canned salsa (instead of the fresh tomatoes) for a mid-winter treat. On a weekly basis, I eat black bean bowls. The truth is, they are never the same. I swap out freekeh for whatever grain I have stashed as a leftover and sometimes mix up the sides. I’ll add guacamole or homemade salsa, depending on what I had at the time. Everything is really loose in this recipe, except for the black beans. The spice combination is always my go-to. Guacamole: I don’t use a recipe, but I can tell you I rarely deviate (and I don’t like any funny business in my guac.) It’s essentially avocados, onion, garlic, serrano chiles, cilantro, lime juice, and salt. Unless it’s July or August, I won’t add tomatoes and occasionally I’ll add a pinch of cumin. Salsa: I have a few, but this roasted salsa has been my go-to in the past few weeks. The Beans: While they aren’t pictured here, I’ve fallen in love with heirloom beans from Rancho Gordo. You can order them online but if you’re ever in the ferry building in San Francisco or in Napa, go check out the selection. I would never have called beans beautiful before seeing the selection at Rancho Gordo. 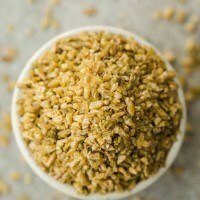 Freekeh: Since the first freekeh recipe I posted, I’ve gotten a few emails about buying freekeh (and the lack of luck). Some of you said when you buy freekeh, the taste is pretty dull. A couple people said their freekeh came with the added benefit of dirt and rocks. I’ve tried a couple varieties but I keep coming back to Bob’s. The flavor is good and uniform, and I’ve yet to find anything other than cracked freekeh. In a medium pot, bring 1 1/4 cups water and a pinch of salt to a boil. Add freekeh, cover, reduce to a simmer and let cook for 20 minutes. The freekeh should have absorbed most the water. Turn off heat and let sit, covered, 5 minutes more. Meanwhile, heat a large skillet over medium heat. Add olive oil, followed by diced onion, bell peppers and corn. Cook, stirring occasionally, until onions are translucent and the corn is cooked through, 7 to 8 minutes. Add lime juice, stirring up some of the bits and pieces stuck to the pan. Measure in the black beans, cumin, chile powder and salt; cook for 3 to 4 minutes more, until beans are heated through. Remove from heat, then stir in the tomatoes and cilantro. Divide the freekeh and black bean mixture into two bowls. Serve topped with sliced avocado, a drizzle of hot sauce and some crumbled cheese, if desired. + To make vegan, leave off the optional cheese topping. I’m with you about Rancho Gordo – they’re beans are wonderful. Also, great idea to use freekeh here! Oh my that looks delicious and sounds even more so. I’ve currently been loving a lentil salad with avocado and tzatziki that looks EXACTLY like the dish you made.. haha! What a delicious-looking bowl! I love the colour and the combination of texture! I’ve used Freekeh before and what I love about it, apart from being delicious and nutritious, is how easy you can cook it. It’s even more forgiving than rice! Burrito bowls are a go-to dinner in my house too! So easy, flavorful, and satisfying. I’ve never prepared them with freekah before, I’ll have to try that! I’ve only used freekeh once or twice but I really enjoyed the texture – it sounds great in this bowl and I love the combo of flavours and colours you’ve got going on here. Rancho Gordo beans are my favorite “luxury” item in my kitchen- I never thought beans could be that good until I tried them. I’ve yet to try freekeh, but this bowl looks like it would be a great place to start. meals based on a bowls are always awesome. i have yet to try freekeh, i will definitely check out Bob’s soon. Looks like a bowl I’d go crazy over. This looks like most of the meals I enjoy making this time of year. I’ve recently become a big fan of Bowl meals, too. They look great and taste awesome. I haven’t tried freekeh yet, but will check out Bob’s soon. Black beans are always a favorite of mine. Made this is it is SOOOO good! Thank you for the recipe! It was a hearty, whole food, and soul satisfying meal. The Freekeh I got was from Nuts.com and it was just fine. It really went well with the black bean mixture. BTW–I love your blog and will be trying more of your recipes. I can’t wait!